On Wednesday and Thursday, temperatures are expected to reach around 89 degrees, with isolated night showers. South Florida was expected to get some showers Wednesday morning, but it is expected to be sunny by the afternoon. By Friday and through the weekend, shower and storm chances will increase. The change will bring most of the sunshine to the skies for the morning hours with thunderstorm chances expanding in the afternoon hours. 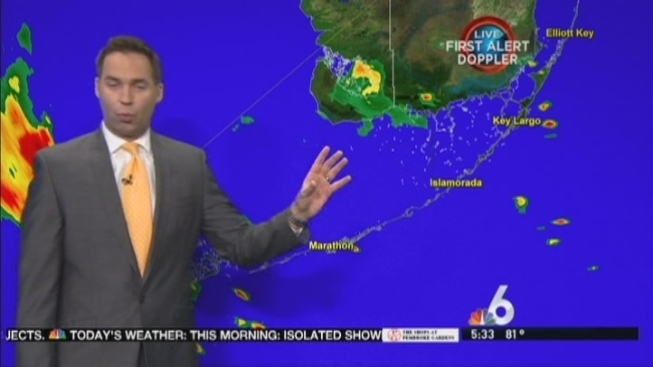 Click here for the NBC 6 Interactive Radar. On Wednesday and Thursday, temperatures are expected to reach around 89 degrees, with isolated night showers.Friday was expected to be cloudy with scattered afternoon showers and thunderstorms, with temperatures around 90 degrees.